An evening pause: I find the precise dance of her fingers on the fretboard as she plays to be mesmerizing. The new colonial movement: Angola has enacted its first space strategy, aimed at encouraging a new space industry in that nation. The document is mostly government bureaucratic blather. More important, it seems mostly centered on what Angola’s governmental space agencies will do in the future. The policy makes nice about encouraging the private sector, but offers little to actually accomplish this. Nonetheless, this action once again shows that more and more countries across the globe want in on the exploration of the solar system. The international competition is going to be fierce. This is good news: Evergreen State College now faces a significant budget deficit because of a sudden drop in enrollment. I can’t understand why anyone at this time would want to go to this college. The administration there was clearly willing to allow mobs of thugs roam the campus, threatening to beat up both students and teachers who dared express any dissent to the thugs political demands. The sooner this school either goes bankrupt, or undergoes a complete change in its administration and staffing, the better. Japan’s Venus orbiter Akatsuki has discovered a previously unseen equatorial jet with wind speeds that often exceed 200 miles per hour. The winds, named “equatorial jet” by the research team, were found from July to August 2016 when an infrared camera captured images of areas about 45 to 60 kilometers above the planet’s surface. The areas are invisible at optical wavelengths due to extremely dense clouds of sulfuric acid. The camera spotted thick clouds traveling at a speed of 288 kph to 324 kph near the planet’s equator. Based on the news reports, it appears the significance of this discovery is that they identified a particular jet stream at a specific latitude. Previous observations did not have that resolution. This would have been posted in the morning, but the internet access here in this Torrey hotel is almost as slow as what I experienced in Glacier. I had it written, but I sinply couldn’t get it to post this morning. 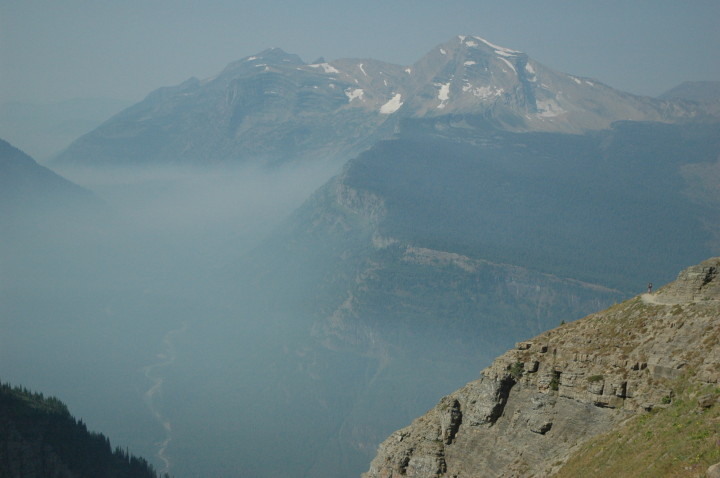 One of the main activities for almost everyone visiting Glacier National Park is to drive across the park on Going-to-the-Sun Road, which crosses the mountains and probably has some of the most spectacular scenery of any road in the United States. During our visit this week we entered the park from the west side, spent several days there hiking trails, then took this road across to the east side, where we did more hiking. The highest point on Going-to-the-Sun Road is Logan Pass. The park service has built a visitor center there, where everyone stops to do a short hike and admire the views. The trail head for the more challenging Highline Trail, which we did soon after arrival, is also here. When I saw this I was quite amused. The glaciers in the park are expected to be gone in only three more years, by 2020? Not a chance. I thought, they are going to have to change this sign soon. In fact, based on my experience with past failed global warming predictions, I was actually surprised they had let this display stay there this long, and hadn’t already made it vanish to be replaced with a new doomsday prediction that was far enough in the future that they could use if for awhile to generate new fear (and funding) before it too turned out to be wrong. An evening pause: As Diane and I drive south from Glacier National Park, heading to Capital Reef, this travel song somehow seems appropriate. to flip the satellites between contracted SpaceX and Arianespace launches. Their ability to do this now demonstrates the wisdom of SES’s policy in the past decade of aggressively supporting SpaceX. The result is that the company now has a much greater flexibility in how it gets its satellites into orbit. Posted as we drove through Bynum, Montana. Capitalism in space: Sierra Nevada’s engineering test vehicle for testing its Dream Chaser design has completed tow tests at Edward Air Force Base in California and is now being prepared for flight tests. Posted on the back roads of Montana during our drive from Glacier to Capital Reef. NASA officials have shut the Johnson Space Center due to flooding from Tropical Storm Harvey, though all essential operations involving ISS and the Webb Telescope continue. They hope to reopen quickly. Russia and China to team up to explore Moon? Russia and China appear ready to sign a cooperative agreement involving the joint exploration of the Moon from 2018 to 2022. The deal is expected to be signed this October and will bring significant benefits to both nations, particularly in manned and future missions to the moon…. The bilateral agreement will cover five areas including lunar and deep space exploration, developing special materials, collaboration in the area of satellite systems, Earth remote sensing, and space debris research. No details yet. Moreover, the deal itself has not yet been signed, so this might all vanish into the ether. It does appear however that Russia’s financial problems are forcing it to partner with others, and China presently has a very sophisticated but inexperienced space program and lots of cash. Russia’s experience would be a great help to China, until they don’t need it anymore. Thus, the logic of the agreement. Posted from the lobby of the Swiftcurrent hotel at the Many Glacier area of Glacier National Park. Diane completed a 10 mile hike today early, so we have the afternoon to relax. Tomorrow we make the long drive south to Capital Reef. Capitalism in space: Orbital ATK today launched an Air Force satellite using its Minotaur rocket. The launch also reactivated a Kennedy launchpad that hadn’t been used since 1999. An evening pause: A beautiful performance on the piano of this “Explosions in the Sky” musical piece. North Korea has launched another ballistic missile. Not much information yet about its range or capability. Update (now that I am off the mountain and back in the lobby, able to post): It appears North Korea successfully launched three short range ballistic missiles on Saturday. Initial reports had suggested that all were failures. Now it appears that all were successful, flying about 150 miles. An evening pause: Hat tip Carole Brabham. Capitalism in space: Firefly Aerospace, the company that was forced into bankruptcy when it lost a Virgin Galactic lawsuit for stealing their proprietary engineering, has emerged from bankruptcy. The full article is behind a paywall, but it appears that the company includes its same management staff under a new owner. The uncertainty of science: Astronomers have produced the best image so far of the surface face of a star. The star is Antares, and it provides some details of the star’s complex outer layers. If I was home and had good internet access, I’d post it here. At the same time, it should be noted that this is not a real image. It is recreated from four telescopes, using interferometry to combine the images, and also includes it a great deal of assumptions and uncertainties in its creation. Capitalism in space: Interstellar Technologies, the private Japanese rocket company attempting to enter the launch market with a low cost suborbital rocket, will attempt a second test flight before the end of the year. Their first test flight failed to reach space when they had a communications problem and had to terminate the mission early. Capitalism in space: SpaceX this week unveiled the flight suit that passengers will wear during their Dragon flights to and from ISS. This is not strictly a spacesuit. It has limited capabilities, and can essentially only be used during the ferry flights. Nonetheless, I guarantee it as well as Boeing’s were developed for far less and much quicker than anything NASA could have come up with. Capitalism in space: SpaceX today successfully launched Taiwan’s first homemade commercial satellite. After a short hike this morning Diane and I decided to relax the rest of the day. Time to catch up on other stuff. The picture below will help explain why I am not posting much this week. My wife Diane and I are in Glacier National Park, and today we did a 12 mile hike on the Highline Trail, considered by many to be one of the best trails in the U.S. I’ve done a lot of hiking in my life, and I have to agree. I hope good internet access will return next week, and I will be able to post regularly again. Until then, make sure you look real close at the picture. On the right, at the end of the trail line, is a person. This will give you a sense of the scale here. An evening pause: The only member of Steely Dan playing here appears to be Jeff “Skunk” Baxter, playing lead guitar. The others include Kipp Lennon on vocals, Nathan East on bass, and CJ Vanston on keys. A evening pause: Hat tip Diane Zimmerman. Just arrived at Glacier, where the internet access is bad, and there is no cell service. Thus, this might be my last post for the week. I will try to post in the evening, but this is a vacation, so it will not be my first priority. If I could do it in my room that would okay, but I have to go down to the lobby of the Lake McDonald Lodge. Anyway the image to the right was taken by me by holding my hand filter out at arm’s length, blocking the sun, and snapping a picture with my camera. 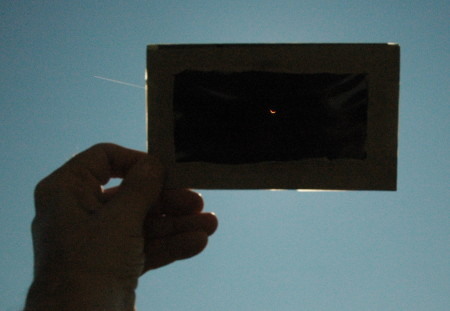 It came out far better than I expected, as you can actually see the sun in the filter, partly blocked. Totality was amazing. I was amazed by two things. First, how quiet it became. There were about hundred people scattered about the hotel lawn, with dogs and kids playing around. The hotel manager’s husband set up speakers for music and to make announcements, but when totality arrived he played nothing. People stopped talking. A hush fell over everything. Moreover, I think we somehow imagine a subconscious roar from the full sun. Covered as it was, with its soft corona gleaming gently around it, it suddenly seemed still. Secondly, the amazing unlikeliness of the Moon being at just the right distance and size to periodically cause this event seemed almost miraculous. Watching it happen drove this point home to me. And since eclipses themselves have been a critical event in the intellectual development of humanity, helping to drive learning and our understanding of the universe, it truly makes me wonder at the majesty of it. I do not believe in any particular religion or their rituals (though I consider the Bible, the Old Testament especially, to be a very good manual for creating a good life and society), but I do not deny the existence of a higher power. Something made this place, and set it up in this wonderous way. Today’s eclipse only served to demonstrate this fact to me again. Posting will be light for the rest of the week. If I get a chance I will add some more pictures to this post tomorrow. An evening pause: Though this song has nothing to do with it, the lyrics to me somehow fit with today’s eclipse. New evidence in the scandal surrounding the computer staff used by Democratic congressmen shows that the chief of staff for Yvette Clark (D-New York) apparently okayed the loss of $120,000 worth of missing computer equipment, thus hiding the loss from investigators. A senior House official with knowledge of the situation provided TheDCNF with new details about how exactly the brothers are suspected to have stolen the equipment and possibly data from Congress, raising questions about the members or staffers who were signing the checks on equipment purchases. It is not clear who actually did this, as there was a change in staffing at the time. Either way, it once again appears as if the Awan family had some dirt on the Democrats, and was using it to compel their cooperation in a variety of illegal acts. The Trump administration has decided to not renew a pro-global warming climate panel set to expire this week. The panel is part of the National Climate Assessment, a group aimed at helping officials and policy makers integrate the US Government’s climate change analysis into their long-term planning. A mandate for the 15-member Advisory Committee for the Sustained National Climate Assessment is set to expire on Sunday, and will not be renewed. The press will paint this panel as an objective collection of climate scientists put together to provide the president with good advice on the climate. In truth, it is a part of the propaganda machine for the global warming part of the climate science community, designed to push their conclusions while excluding any skeptical input. Once again it appears that while Trump might be wishy-washy on many issues, on climate he is serious about dismantling the corruption that has worked its way into that field while eliminating the over-regulation that this corruption has imposed on American society.